This game does not include plastic cups pictured. 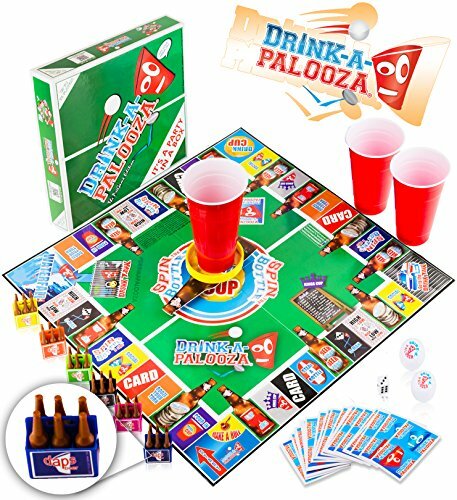 DRINK-A-PALOOZA IS NOT INTENDED FOR USE WITH ALCOHOL. HOWEVER, IF ALCOHOL IS USED IN THE COURSE OF THIS GAME, PLEASE DRINK RESPONSIBLY. – Easily Amusing! Home / Product LegalDisclaimer / This game does not include plastic cups pictured. DRINK-A-PALOOZA IS NOT INTENDED FOR USE WITH ALCOHOL. HOWEVER, IF ALCOHOL IS USED IN THE COURSE OF THIS GAME, PLEASE DRINK RESPONSIBLY. This game does not include plastic cups pictured. DRINK-A-PALOOZA IS NOT INTENDED FOR USE WITH ALCOHOL. HOWEVER, IF ALCOHOL IS USED IN THE COURSE OF THIS GAME, PLEASE DRINK RESPONSIBLY.